When you’re looking for utility trailers for sale and enclosed cargo trailers for sale there is no one better to turn to in the US then Yucaipa Trailers, the company with the massive inventory which is 10 times larger than the average dealer. They’re also proud to say that their family owned and operated and have over 25 years of experience in the industry. 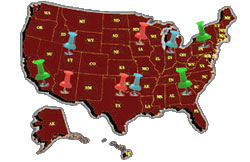 Yucaipa Trailers also has various locations throughout the US so that it is always convenient for you to pick up your trailer and drop it off. You can also go to their website for more information or to sign up for their free e-mail newsletter to grant exclusive access to hot offers and special deals. When there comes a time when you need good utility trailers to get the job done no one serves you better than Yucaipa Trailers. They have many different options for you to choose from in various sizes to meet your needs. All of their trailers are built to last and are of the highest quality. When you are transporting items that need to be stored in enclosed cargo trailers Yucaipa Trailers has exactly what you need. You can take a look at their inventory online to see exactly what they have available.